This is broken into 2 parts because blogger won't let me upload as many pics as I want. whatev. *Disclaimer: My sewing experience is limited to taking a Home Ec class in high school and what my mom taught me when I was 10. Luckily, I remembered most of it. So Friday morning, we set out to the Fabric Store to pick out some fleece for #1's napmat cover. 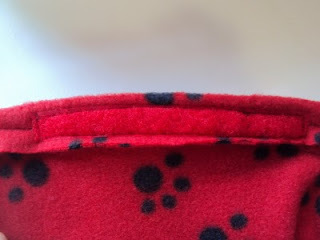 We decided on this red with black pawprints pattern. It was definitely a compromise-I picked some that he didn't want and he picked some that I didn't like. This was the only one we agreed on. I figured, why not let him have some input, it's not that big of a deal. 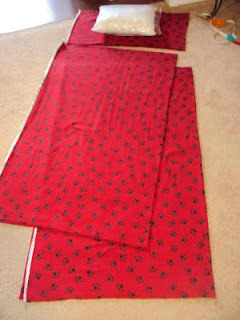 We got 3 yards, enough for a slipcover for the mat (I found some E-Z instructions on line. 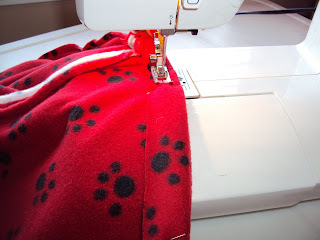 It's basically like sewing a pillowcase, which anyone should be able to do, really. 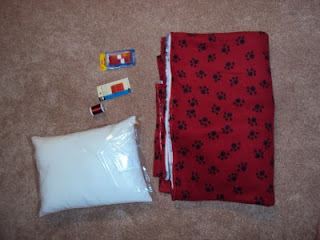 I mean, I can, and that's not saying alot), a small throw blanket, and a little travel pillow and a pillowcase for that. 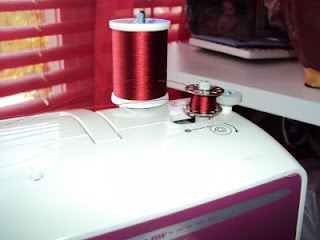 We also needed thread that matches, a couple sew-on velcro strips for the bottom (not a necessity, but I figured it would help my shoddy sewing job stay on the thing), and some new needles for the machine. Next up, get her out and dust her off. I got the spool on the right place on top, I think, so that's a good start. Oh yeah. Good thing I remembered. 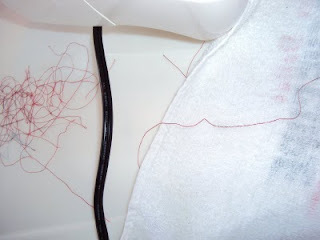 There's a bobbin (smaller spool) that goes in the bottom that sews the bottom of the material. Let's see if I can remember how to get some thread on that. I'm not gonna lie, I had to look it up. I seemed to have lost the manual. Now I need to find something to practice on and make sure all the threads are going where they should be. mmmm, sweat towel on floor right next to me from run this am? Works for me. As you can see from the pile of thread above, it took several tries. The top and bottom threads kept coming unthreaded. SO FREAKIN FRUSTRATING. But eventually, sucess. Next: roughly measure out and cut pieces I need. I pinned the 2 "wrong" sides together (well, this particular material didn't really have a wrong side, I don't think. 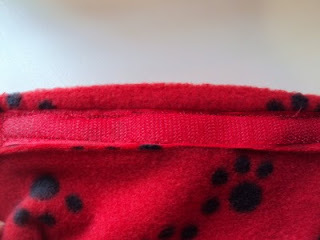 I couldn't tell a difference) and sewed around 3 sides. 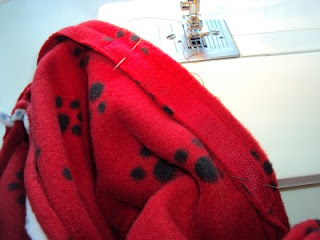 Then I sewed a cuff on the bottom part of the open end. Here was my only major goof: I cuffed it on the wrong side. UGH. I am so not going around it with a seam ripper and un-doing it. So, I just folded it again on the right side and sewed over it AGAIN, chanting "Don't break! Don't break!" to the needle as it was plugging through the thick fold. So far, So good. Then, I pinned the velcro strips roughly where I wanted them on the cuff. I had a much narrower width to work with due to the extra fold. The next 2 pics are what the velcro looks like sewn on. 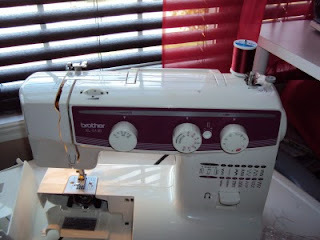 Just imagine to yourself alot of to-my-self cussing and 2 broken needles, along with picturing me re-threading the needle on the "toothy" velcro strip about 397 times. It was a B-E-A-T-I-N-G. Luckily, the soft sides of the velcro and the 2nd toothy one went alot better.